Goodreads|Check out Amanda Grace on Twitter or her blog! The Truth About You And Me is an e-ARC from netgalley.com, which hasn’t influenced my review in any way! Goodreads Summary: Smart girls aren’t supposed to do stupid things. 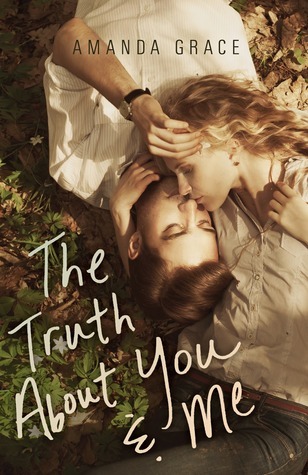 When I saw the summary for The Truth About You And Me, I knew i had to read it! There’s something about student-teacher romances that are sort of intriguing. I liked that it was a couple letters written by Maddie to her professor. What was interesting about Maddie writing the letters was that she wanted so desperately to explain what she was thinking and what it was like for her while she fell for Bennet. She very much believed that she was in love with him. And she wrote the letter to get him out of jail, because she thinks it wasn’t completely his fault. That brings up a really interesting point. I mean, she was 16, never mentioned she was 16 (even though she meant to) and she wanted it to be known what really happened. Also: he (understandably) assumed she was 18/19, but also was horrified when he realized/found out she was 16. And: she was of consenting age. Well, except for the fact that he was her professor, and it is mentioned that he’s in a position of authority. Well, according to an unknown source that Maddie found when she googled the age of consent. She seems aware enough to google it. But as much as I hate to say this: she was also dumb enough to not tell him she was 16, and to go through with it anyway, even while “knowing” he was her professor. I found all of that so interesting though. I wasn’t expecting Bennet to be horrified, and he’s about 9 or 10 years older than her, so while the age difference is pretty noticeable for the two of them, I was also sort of expecting him to not care. So kudos to Grace for doing something unexpected! So, Letter #1 is meant for the police, and letter #2 is what happened when he took her home. Part of me wanted to see a bit more of the time they spent together, but I also liked that she poured out her feelings and how it was love at first sight. I liked that the entire book was comprised of two letters. And that they actually read like letters and weren’t broken up. However, because the story is told we letter form, we’re told what has happened, instead of actually seeing it. Which, I suppose, is the what Grace was going for, since Maddie is telling her side of the story. The ending (which is the last letter) was a little expected. It’s not surprising that they end up running into each other while hiking two years later, but what was surprising was that there’s a mutual agreement of how it ruined Bennet’s life. There’s no happily ever after- well, not for Maddie and Bennet- but it is nice they had a chance to talk for a few minutes. Although…he quit before the school could investigate what was going on, and moves across the country without facing any other consequences other than talking to the police. Who, by the way, didn’t press charges because it wasn’t a clear case, and Maddie and Bennet insisted that nothing happened. Bennet didn’t make a big impression, which is a little strange because Maddie’s writing the letters because she thinks he’s in jail and wants to get him out and because she wants to explain happened. But interestingly enough, The Truth About You And Me is more about that than their romance. I really liked The Truth About You And Me! I like that the story was told in two letters, and that Maddie wanted to share what it was like for her to fall in love with one of her professors. While Bennet taking Maddie home after learning she was 16 (and his reaction to learning how old she really was) was refreshing and unexpected, he also seemed to face relatively few consequences. The Truth About You And Me gets 4 stars.